im a relative SUP noob, with a strong surfing and kitesurfing background. At 6'5 and 95kg I'm riding a 10'Whopper mostly, but also have a Jimmy Lewis Quad 9'7. My SUP surfing is past noob stage and I do ok at the local but my question is about paddles. The whopper came with this narrow blade paddle that seriously is close to useless. The JL cam with an adjustable paddle, and I use this most of the time, but its damn heavy and flex's a lot. I find I'm losing a lot of power, especially at that critical late pivot and take off moment. Borrowed a paddle off a mate yesterday that was really stiff and it was a game changer. Instant power and amazing thrust when I needed it. So what's the go? What's the difference in paddles, what are the options and what does everyone recommend? In terms of paddle height, between nose and head height is standard for shorter high performance (shortboard surfing) SUPs. For longboards like your Wopper, longer is better. It keeps you more upright and forces your style to improve. Trying to surf longboard SUPs like short SUPs looks yuck. Because you have so much glide speed on a longboard there is no need to go short with the paddle. For blade size i personally like small blades. I'm also 95-100kg and have always used tiny blades (i even cut and re-glassed mine back in the day before any manufacturer came out with smaller ones). With the correct technique, you will get the same hold out of a tiny blade as you will a huge blade. Most of the time i use an adjustable carbon 35 Fanatic paddle. I think it is one of the nicest allround blade shapes there is. Bigger blades make entry and exit harder. Also leaning on your paddle through a turn doesnt feel as nice. Some paddles have varied shaft diameters. This is more of a personal preference and feeling. For surfing, a the thinner shafts feel nicer as you are swapping sides frequently and fast. However the thicker diameter shafts have less flex which is nicer for power transfer. Looked up the Fanaric 35. Only size at the one site I checked was 7'25". Is this total length at full extension? When you say small blade, how is this measured? Area, width? I'm guessing the 35 relates to the shaft diameter? Sorry if my questions are a bit ignorant but am trying to get some good solid info so I can go into the shops knowing what I'm looking for, but also take some advice from the retailer. Any other advice out there. What's everyone else using? Sorry for the confusion mate. 35 is 35% carbon. The higher the carbon the stiffer the shaft (generally). Also the price point increases. For surfing i prefer less carbon just in case you land on it as fibreglass allows more flex instead of brittle fracture. 7.25" is the width of the blade. A lot of companies measure the surface area of the blade instead of the width. I recommend less than 90 square inches for blade size. Every paddle comes long enough to be cut down to any size human. I like the user friendly aspect of paddles like the Ke Nalu and Sunova... or any paddle that is put together with "Hot Glue", instead of epoxy. Ke Nalu offers an "extended Ergo T" handle, that has a 10" long handle hosel, which allows you to change paddle length with a heat gun. big bonus.... if you break any part of the paddle, it is easy to replace a broken component.... instead of buying a whole new paddle. I also like a bit of flex in the shaft, because it is easier on shoulders. Narrower blades allow you to paddle closer to the rail and paddle a quicker cadence. Light is awesome.... spend extra for light weight, you will feel the effects for the life of the paddle. Surfing, I use 2" over my head... some like shorter, but I find, in chop, too short results in missed strokes and more falls. Your stroke will become more effective as you progress, and you will find that a large blade won't make you faster. Hi Simon welcome to SUPing . Paddles like heaps of things in suping can be confusing . The advise given here is great . Heres my take now , go for a smaller blade , get an adjustable paddle so you can play with the length this wont be your only paddle . Get a good quality adjustable with a good clamp system . Leakage is the issue here and the clamp needs to be tight and small. Different types and styles of suping have different lenghts of the paddle so an adjustable is the go first up. Once you sort out your boards and the type of paddling your keen on then spend the big bucks on a fixed paddle. Then your adjustable becomes your spare . Have fun . Thanks for the feedback guys, Its helped me narrow down the search a little. I'm amazed at the huge variations in price on paddles. Pretty hard to understand the difference as a noob. Maybe I can test a couple of demos out. I'm pretty certain I'll stick with surf Sup only and look at a smaller board once I get things a little more wired but keep the big girl for the small days. Just get one of these! +1 on the XTuf... Just got one of these a couple of months ago after a few years of Fanatic Paddles.... 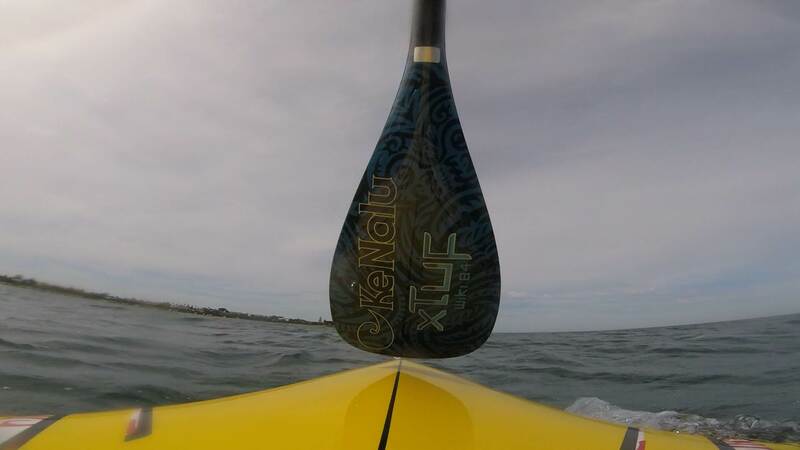 Nothing wrong with the Fanatic (7.5 Blade) but the thin shaft and flex of the Ke Nalu is much more comfortable in the surf. Have kept the Fanatic for my race board and find the larger diameter shaft weird now. The comments about an oversize blade being hard on your shoulders etc is spot on too.... when I started I had a large blade paddle and noticed the strain on my arms etc.... Some advice from Angie up on the gold coast to switch to the 7.5 probably saved me a serious shoulder injury. Thanks for all the input. Whilst I was away on site my wife and mate conspired and got me a paddle. Yes I was pretty dubious not having even tried it but it's changed my surf paddling. The instant thrust has increased my wave count considerably. Carbon paddle from YoB SUP on Canning highway. Seems to fit all of the above criteria, super light, not to big, little bit of flex and at around $200 (she won't tell me how much it was exactly). Thanjs again all. See you on the water.